To keep your trees in good health, both structurally and physically, implementing a regular tree cutting schedule is a great idea. Not only will the tree have a better vigour, but it will look at lot more aesthetically pleasing. There are two way to go about tree trimming, by using a professional tree cutting service or the DIY approach. We will give you all the information you need to execute whichever direction you decide to go in. What do tree cutting services cost? Tree cutting prices depend on a lot of factors, but the 3 big ones are the height of the tree, the location on your property and the complexity of the tree cutting required. We also need to stipulate whether we are talking about complete tree removal or just cutting some branches. The below sizes will include prices from trimming some branches to complete cutting down and removal of the tree. The biggest factor is the size and without going into too much detail we are going to break this up into 4 categories of height. Small tree trimming cost – 1 story high (3 – 5m) high. Small trees less than 1 story high (3 – 5m) will cost $150 – $650. They include trees such as bottle brush, wattle and Magnolias. You will need to add $50 – $100 for the grinding and removal of the stump. Tree sizes would include anything from 1 – 2 stories high (5 – 9m) and will cost you $350 – $1200. This price is purely based on the possible size and height of the tree and does not take into account the complexity of removing particular branches. Types of trees would include Liquidambars, London plane trees and some species of privet, Eucalyptus and Jacaranda trees. Size for what we refer to as large trees would be anything that is 3 stories or higher. These tress can cost quite a bit more. I would expect $850 – $5000 depending on whether you were just getting a branch cut or the whole tree cut down and taken away. They types of trees that grow this large are Oak trees, Gum trees and of course Angophora’s. 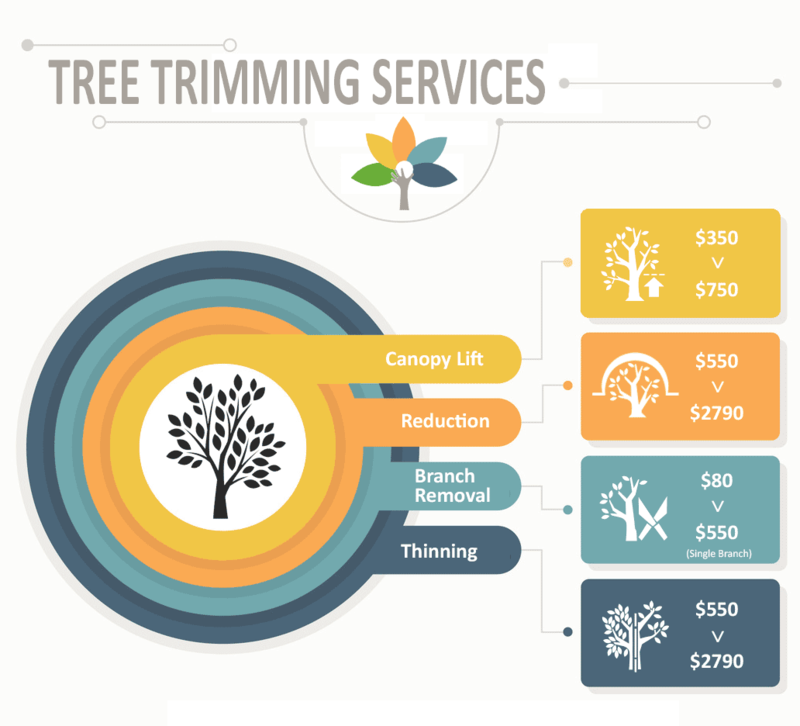 Each of these services do differ in price and we have specific prices for each service in our tree pruning cost guide. Other than height, trunk size or diameter is the other biggest factor that will contribute to the cost of cutting down a tree. Why does this add to the cost, basically the sheer weight and volume of the trees trunk take time and man power to cut down to ground level and then remove from your property. You can save up to 30% off the cost of cutting trees down by asking the company to leave the tree logs on site so you can sell them on eBay for firewood. The money saved requesting the logs to stay compounds depending on access. If the tree is hard to get to like in a backyard, the tree cutting service does not have to spend time, resources to remove the tree off site. Once they have gone, take a photo of the tree logs and sell them on Facebook or the trading post for fire wood. The winning bidder would be more than happy to come and do the grunt work, and the best part is they will also pay you for the logs! Should I use certified tree cutting companies? I highly recommend using a certified tree cutting company. This means the boss is a qualified arborist and is trained to do the work. You can save yourself some money if you have a tree smaller than 5m by hiring a lawn mowing company. But you need to understand there will be a significant drop in the quality of work carried out. The real challenge is getting a qualified arborist to removal your trees at a reasonable price. Here are some things you need to check when getting a tree cutting service out to quote your job. Never take their word for it. Always ask to see their qualifications. The industry is slowly being regulated, but it’s a slow process. There are plenty of unskilled workers posing as the real deal who would be more than happy to take you money. This seems like an obvious one, but so many customers get sold on the first quote. 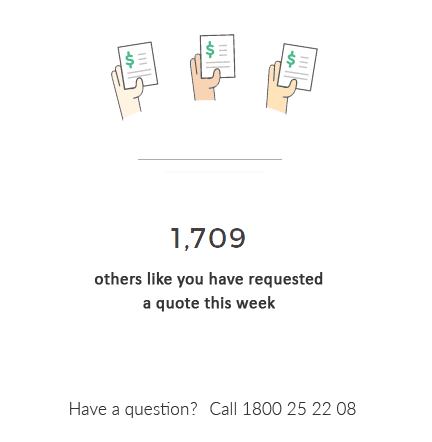 Even if they are an amazing company, I always recommend getting a second and third opinion and price before you pull the trigger. The industry standard is 10 million in public liability insurance. The purpose of this insurance is to protect your home, and your family in the off chance that something goes wrong and the arborist you hired damages your property or hurts someone. This one is not so obvious and is rarely done. It just takes a minute to go to ABN lookup and type in their company name. More than to check they are a company, you want to see how long they have been in business. I suggest someone who has been in the game for longer than 5 years running their company. Also make sure they have not made any name changes. If they have, search the old company name and look for reviews. They might be a totally innocent reason why they changed names, but I would do your due diligence just in case. Sometimes there can be some confusion about what was agreed upon, especially if a week or two pass between the quote and the job being done. As your tree cutting expert to specify exactly what they will be cutting and what the service does and does not include. It saves any surprises for both parties. The disposal of the waste after the tree cutting service has finished is the most costly and time consuming part. Make sure they are going to be taking all the waste with them when they leave unless you specify otherwise. Previous customers vote on the best priced local service after they have received their quote and had their job done. They rate the tree services on price and quality of service ratio. When you request a quote from us, we send you the top voted companies that week to ensure you get the best price and highest quality service possible. It is true that tree cutting services can be pricey. But when done properly will retain the tree’s natural charming appearance and allow it to live longer than a poorly maintained one. However leaving such duties to anyone other than a tree service professional, could cost you in the long run. A poorly balanced tree and branch structure or incorrect cutting techniques can result in the tree’s ultimate demise. Mistakes can be made in a number of ways like not waiting to the right time of year to prune, incorrect tree trimming techniques including poorly balanced trees and not removing all deadwood. When choosing a reliable tree pruning service, you need to bare in mind you will be paying a little more than ‘the local Joe’ with a saw, but it’s not going to be too much more and it will be worth it. This is going to be determined by the particular tree you want pruned. As a general rule of thumb though, you’re best cutting trees in the dormant season, just before we start heading into spring to be exact. This will have the least impact/stress on the tree(s) and the upcoming growth season of spring will encourage growth to heal to wounds left by the removed limbs. Deadwood can be removed all year round. Pests wanting to invade the tree are also going to have it much easier now you have opened up a gaping hole for them to enter. Normally a healthy trees natural defense against pests such as white ants and elm leaf beetle has been sap. When the bug tries to borrow in it drowns. If you open up a wound on the tree, pests can bypass this defense shield and get straight in. It is important to systematically remove deadwood on trees of all sizes as it is a drain on their health. Leaving deadwood on the tree allows water to enter the tree (they only like water to their roots) and other insects and fungus. Removing deadwood will give the tree a chance to heal the wound and seal the entrance for foreign pathogens. For smaller jobs it is possible to carry out tree cutting yourself as long as you follow a few simple rules. Again, I would just stick to cutting trees smaller than 5m (no taller than a single story house) and branches no thicker than your wrist. Trying to tackle trees/branches larger than this could result in injury to yourself or the tree in question. This is done so the branch doesn’t fall too early underweight before you have the chance to finish cutting it. It can tear the bark right down the trunk. This is the most important part of the branch removal process. Understanding where the collar is and making your cut along the collar (leaving the collar on the tree) will allow the tree to heal itself in the quickest and most efficient way. This is a small cut on the underside of the branch (A) to allow to branch to break away clean. This is the cut which will remove most of the branch (B) just leaving you a small stub. This is the important cut. See above (C – D). Pay attention to the 3 dimensions of the branch and make sure you’re cutting along the collar on all planes. And that’s it! Of course large jobs do call for bigger equipment and professionals to make sure the whole tree pruning process goes smoothly. Here at GoTreeQuotes we take the headache out of finding a reliable and well-priced contractor. Just fill in the 23 second form at the top of the page and we will send 3 professionals tree removal specialists around to view and quote the job, with no obligation to hire. All have been voted by past users as having the best quality of work at the most competitive prices.